Through April 5, 2019, Vontobel will be showing the art exhibition "Babysitting a Shark in a Coldroom" by the award-winning, up-and-coming photographer Kelvin Haizel at the bank's head office in Zurich. In this video tour of the exhibition, co-curators Urs Stahel and Luisa Baselgia explain the backstories that shape Haizel's creative work: a “tour d'horizon” of a place where tropical idyll and migration policy are colliding – unfiltered. In his latest work, Kelvin Haizel addresses our recurring quest for personal and social identity. To do this, the artist traveled twice to the archipelago of the Comoros, where Africa and Europe are unexpectedly facing off: It is here, in the middle of the Indian Ocean, where France governs its 101st département, the island of Mayotte – which means that it is a patch of the European Union off the coast of Africa. A newly created political border thus divides an archipelago that was formerly held together by a common history and cultural identity. While three of its main islands now belong to an independent nation, the Union of the Comoros, the fourth island, Mayotte, opted to remain French – and has thus become almost out of reach for the Comorians on the other side of the border, especially since 1994, when Mayotte introduced a visa requirement for all non-EU citizens. Political boundaries, a growing economic gap and cultural roots that no longer bind the islands together: These are the elements that inform Kelvin Haizel's photographs, a fine-meshed net of symbols and sociopolitical allusions, without laying bare the human destinies that play out every day in the refugee boats attempting the hazardous crossing from the Comoros to Mayotte. 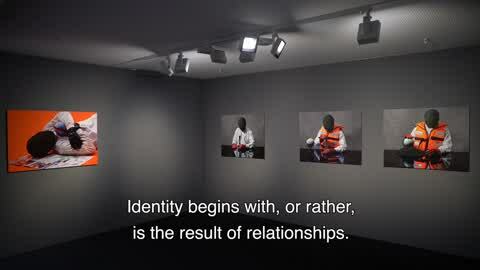 "Babysitting a Shark in a Coldroom"
On this video tour, you’ll gain a first impression of the exhibition "Babysitting a Shark in a Coldroom - Comoros Encounters", and learn from art experts Lusia Baselgia and Urs Stahel how they categorize the multi-layered work of Kelvin Haizel. Running until April 5, 2019, the exhibition at Vontobel’s head office on Gotthardstrasse 43 in Zurich features a number of works by Kelvin Haizel. If you are interested in contemporary art, we recommend booking one of the guided exhibition tours in advance. All information about the exhibition and the tour program can be found at anewgaze.vontobel.com. "A New Gaze 2" focused on art and photography from Africa. Eighty photographers from different parts of the continent were invited to submit a project proposal addressing the theme "Identity". Kelvin Haizel’s winning proposal convinced the jury because he presented identity as a concept that continuously changes through one’s encounters with different people. As he journeyed across the Comoros archipelago, Haizel’s concept gained significant momentum. Here, the artist experienced a situation in which the population’s dreams of the future still recoil from the islands’ complex post-colonial history. With the prize "A New Gaze", Vontobel enables young contemporary photographers to develop their first major projects and make their work known to a wider public. For this purpose, the Vontobel Art Commission works together with connoisseurs of the local art scene all over the world. The jury was under the technical direction of curator Urs Stahel. Subscribe to our Newsletter with information about new acquisitions and the upcoming "A New Gaze 3".